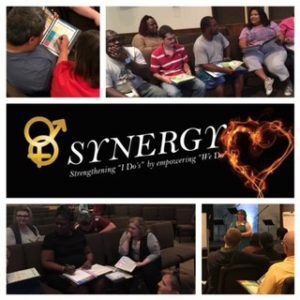 Bryan, Tx–Strengthening Families of the Brazos Valley hosted Synergy: Marriage Retreat on Friday and Saturday in Bryan at Rivergate Church. The retreat was designed to provide tools for couples and engaged couples for better communicating and understanding each other’s needs, appreciation of the value each person brings to the marriage team as well as methods to avoid and resolve conflict. More than 50 couples attended the two-day event and participated in educational courses [PREP: Prevention and Relationship Enhancement Program] presented by SFBV staff. Candis Kelley and fiance, Roy Washington attended the retreat and are planning to marry in August of this year. ” We learned so much about each other and how to communicate effectively. We both will apply the tools that were presented in order to maintain a healthy marriage,” said Kelley. The retreat was a success and goals were achieved according to Nancy Winn, SFBV’s Brazos County Program Coordinator. “With the help of my colleagues, the goal was no different than what the preface of Prep stated…teaching couples about relationship risks and strategies for lowering risks; concepts and risk models. The bonus was having a fun and receptive group,” said Winn. Participants were treated to catered meals, gift cards, marriage license discounts, SFBV’s photo booth and some couples won great door prizes! SFBV is a project within the Family and Community Health unit of Texas A&M AgriLife Extension that seeks to provide couples and individuals with the tools they need to create and maintain healthy families. The marriage retreat will also be held in Burleson, Grimes, Madison and Robertson counties at a future date. The project is funded is provided by the United States Department of Health and Human Services, Administration for Children and Families.